What are some of the best ‘Tips for Beginners’ who are just starting their CAT Preparation? Have you decided to take the plunge and try your hand at CAT 2019? Are you pretty much clueless about what the hoopla is all about? I will try to answer these and many more questions related to CAT preparation especially from the perspective of beginners who are trying their hand at CAT for the first time. Most CAT aspirants start preparation for CAT in their final year or pre-final year. As a matter of fact, if someone forced me to guess what you do right now – my guess would be that you are a male engineering student in 3rd or 4th year. Basically, that is the time when most CAT aspirants start thinking about an MBA. If that is the case with you, please understand that your graduation score is a very important parameter for your selection at the top IIMs. So, if you still have couple of semesters (or couple of years to go), please try to improve your graduation percentage. It will play a big role in the long run. CAT exam is typically conducted in the last week of November or first week of December. The exact date and paper pattern is announced in last week of July or first week of August. CAT results are declared in second or third week of January. College interviews are conducted in February-March. Old IIMs: Ahmedabad, Bangalore, Kolkata, Lucknow, Indore, and Kozhikode fall under this category. These were established in the last century. Even among these, ABCL (established in 60s-80s) are a lot more respected than K and I (established in 1996). New IIMs: Rohtak, Ranchi, Raipur, Tiruchirapalli, Kashipur, Udaipur were established in 2010-11. They have also created a niche for themselves. Baby IIMs: Nagpur, Vishakhapatnam, Bodh Gaya, Amritsar, Sambalpur, Sirmaur, Jammu were established in 2015-16. It won’t be wrong to say that they are struggling. Their intake is on the lower side and if you are serious about your preparation – this is the lowest you should aim for. Special mention: IIM-Shillong was established in 2007. It would be unfair to put it in any of the above categories but it would be fair to say that it stands above the new IIMs and below the old ones. I would grant you that there is some argument about which one is better between IIM-B and IIM-C. A similar case could be argued about IIM-I and IIM-K as well. But I will be honest with you – if you are getting one of these options, it won’t be too different from the other. Your career would primarily depend upon what you do in the two years in college. The IITs also have pretty good MBA programs or have complete B-schools of top quality. IIT-Bombay, IIT-Delhi, IIT-Kharagpur offer MBA that is better than the New and Baby IIMs. Programs offered by IIT Kanpur and IIT Madras can be considered better than the ones offered by Baby IIMs. Couple of other good colleges that accept CAT scores are Delhi School of Economics, IMT-Gaziabad, and IMI-Delhi. Please note that you will need to apply to a lot of these colleges before the CAT exam is conducted. Application to the IIMs is included in the CAT form but you need to apply to these colleges separately. XAT – It is used by XLRI, XIMB, GIM, XIME and a bunch of other good B-schools. IIFT – There are three branches of IIFT – Delhi, Kolkata, and Kakinada. They conduct their own exam to select candidates. TISSNET – TISSNET scores are used by Tata Institute of Social Sciences for their programs. SNAP – SNAP scores are used by Symbiosis group for their B-schools. Some of the good colleges under SNAP are SIBM, SCMHRD, and SIIB. NMAT – NMIMS is a good college that accepts NMAT scores. NMAT score is also accepted by a bunch of other B-schools also but they are tier-2. Do not think of yourself as a CAT aspirant. Think of yourself as an MBA aspirant. Depending upon what your goal is, it would be a good idea to apply to a large number of tests. Doing an MBA is a costly affair. An MBA from a top college can cost anywhere from 15 Lakhs to 20 Lakhs. IIMs are government institutes and offer a lot of financial aid and scholarships but it is not going to be easy to finance your education. Loans are a way to make the job easier but please do a cost benefit analysis of the whole thing before you take the plunge. Yes – there are some cheap MBAs like the ones offered by FMS or DSE but there are very few seats and the competition is really high. Please understand that every college you apply to – every test you attempt would cost you anywhere from Rs. 1500 to Rs. 2000. So, if you end up attempting 5 tests and applying to 20 colleges like any other CAT aspirant – it would cost you close to 50,000 Rs. just to apply to these. Then there might be additional costs involved in going for various interviews, test centers, etc. Also, it does not take much to turn the tide of the job-market. The next financial crisis might be just around the corner. There could be economic policies by the government that could derail the economic growth and we have seen examples of that in the recent past. Automation has eaten up a lot of jobs and who knows what will happen next. I am not trying to scare you but just trying to tell you that a lot can change in 2-3 years. The most common misconception that I have seen among CAT aspirants is that all they need is a good CAT score and then “Life is set”. Sadly, nothing could be farther from the truth. CAT score is just one of the parameters considered by B-schools before even inviting a candidate for an interview. Once invited, the candidate is tested on a bunch of other skills. This is the reason you might hear about candidates who scored 99.5+ %ile and still did not get a call from IIM-A or IIM-B or IIM-C. This is the reason why some students get interview calls from 5 different B-schools but are not able to convert any of those calls. It would be a good idea to start preparing for current affairs, written ability tests, group discussion, personal interview from Day 1 of your CAT prep. Even if you dedicate 1 hour a week towards this aspect of preparation, it will be more than enough. 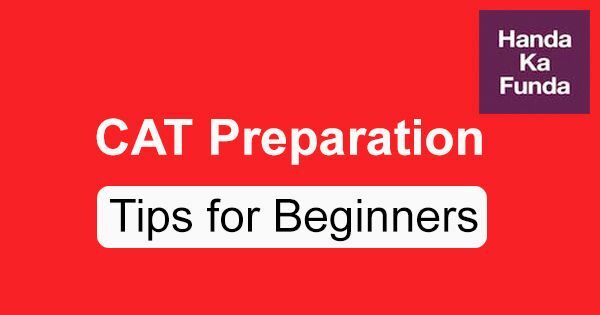 CAT Prep Strategy – How to Start Preparation for CAT 2019? How can one effectively utilize a career gap while preparing for CAT? I hope you enjoyed this post but let me assure you – I am not done yet. Very soon, I would publish another post in this series where we would talk about some more CAT Preparation tips for beginners. I am a NIFT graduate in Fashion Technology and want to pursue a career in MBA. Please suggest if it would be possible to crack the CAT2018 when less than three months left .